My work encompasses a wide range of lutes, ranging in size from the small octave lute by Vendelio Venere (original in the Kunsthistorisches Museum in Vienna) to the great octave bass lute by Michael Hartung (original located in Germanisches Nationalmuseum, Nuremberg) and in design from early Renaissacce lutes (Cathedral of Freiberg, Saxonia) to Baroque lutes (by Widhalm, Germanisches Nationalmuseum) and on to the thourough bass instruments Chitarroni and Archiliuti. All of these have been built in my shop. Generally speaking, I adapt a replica to suit the individual needs of the player. For lutes, the transient response from the plucked string is of emminent importance, energy being induced only once. 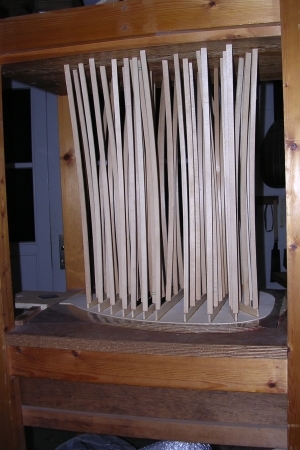 For this reason, I take great pains in tuning the individual parts of the lute top and also take special care to match top and body.